This past weekend, Henry, Mark and I attended the Annual Cookie Walk, (although this was the first time we heard of it and attended it). It was a fun holiday event in which church parishioners at St. Nicholas of Myra Orthodox Church, bake a variety of holiday themed cookies and sell them to raise money for their church. Henry was able to gather as many cookies as would fill a Chinese food takeout box. He also crafted a snowman from marshmallows. Currently, Henry is very intrigued by snowmen and really wants to build one. He ended up eating one instead. Leading the advance up Broadway, past Grace Church. We attended the rehearsal dinner for our niece, Michelle’s wedding to Tyler Goff, for which Henry will be serving as ring bearer. He did really well at the rehearsal considering he did not have a real nap the whole day and we were expecting the worst. The rehearsal dinner was held at Emeril’s Delmonico and Henry held up with a great spirit until he just couldn’t keep his eyes open anymore. We are hoping for the best tomorrow for the big show. 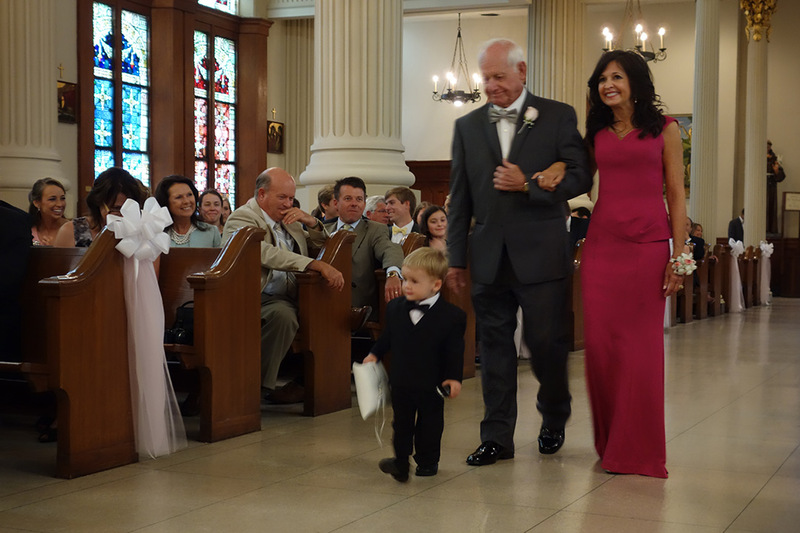 Henry’s practice run down the aisle. Henry passes out on my lap during the toasts.